The Priorat is a county and within that county reside two official wine regions, the Montsant (D.O.) and the Priorat (D.O.Q). 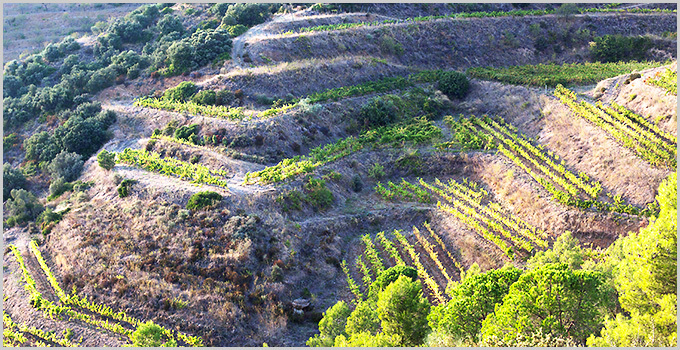 Geographically the Montsant wine region surrounds the Priorat wine region. The soil is what makes the two wine regions very different. The soil is Priorat is called “llicorella.” It is a all slate, layers upon layers and said to give Priorat wines their defining characteristic. In the Montsant D.O. the soil types vary. There are limestone, red clay, stone, and some of the same slate that’s in the Priorat, but only in a few areas of the region. The main grapes in both areas are Garnacha, Carignane, and Garnacha Blanc. Other varieties are grown but in small amounts. • Trossos Winery – A new winery with guest rooms. Views!